The origin of energetic particles responsible for the premature deaths of many satellites has been traced. Image released July 25, 2013. Super swift electrons around Earth have been blamed for the premature deaths of satellites, and now scientists think they know how these particles gained their speed. According to new data collected by NASA's twin Van Allen space probes, electrons within belts of radiation that circle Earth are excited by electromagnetic waves around the planet. In the future, this new information could help scientists learn how to better protect satellites and prevent them from sustaining damage from errant charged particles. 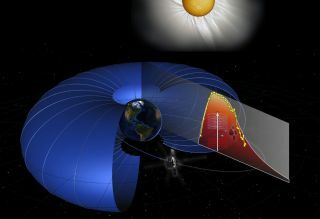 "Electrons — in their motion through the magnetosphere and through the radiation belts — one of the motions they have is they spiral around and around the magnetic field," Reeves, a senior scientist at Los Alamos National Laboratory in New Mexico, told SPACE.com. "I think of it like a tetherball. The pole is the magnetic field, and the electrons are going around and around. What the electromagnetic waves do is, they hit that tetherball — and if you're hitting it at the right time, each time it goes around, then it goes faster and faster and faster." The accelerated electrons in the radiation belts can damage spacecraft in orbit around Earth. Many satellite malfunctions caused by radiation-belt electrons are often fatal, Reeves said. The charged particles can enter a satellite's system at high speeds and wreak havoc on the electrical systems within spacecraft. "These electrons are moving at more than 99 percent the speed of light," Reeves said. "They're the fastest things the Earth produces naturally, and that's energetic enough that it goes right through the skin of a satellite — and these electrons embed themselves in the electronics inside the satellite." "When they build up too much, you can get discharges inside the satellite, and the satellite either malfunctions or sometimes totally fails," Reeves added. This is only the beginning of Reeves' investigation into the electrons of the Van Allen radiation belts. He hopes to trace not only the origin of these electrons' acceleration, but the exact kind of electromagnetic wave exciting the electrons at a specific frequency. That information could help scientists and engineers craft a more robust spacecraft sometime in the future. "If we know what's accelerating the electrons, then we want to know what kind of wave it is," Reeves said. "Maybe now we can monitor for those waves and have a better idea of when they're going to accelerate electrons. We can go a step further back from that and say, 'What's creating those waves, and are the conditions right in the magnetosphere for making those waves?'"